Presented here, a truly gorgeous American Painted Tin 1-Sheet Waiter. Obviously the work of a master painter whose graceful, fluid brushstrokes flowed effortlessly onto the tinware. 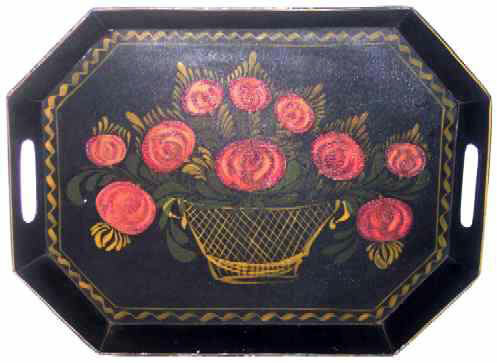 The large basket of Roses has a Theorem-like quality and literally fills all of the available space on the Tray. Encircling the floor of the tray is a yellow ribbon border. The treatment of the roses with their cross-hatched centers gives the look of the interior of a rose. This particular formation of overtone strokes is also found in the Berlin designs and is most likely the work of Edward Francis who worked in the Filley Connecticut Shop as well as in New York and in Philadelphia. Francis was born @1800 and died in 1826 of consumption. While many of the specific characteristics listed above for Edward Francis may also be found on tinware attributed to other shops, the one point that separates Francis' work from that of the others is the expertise of his brush work. "His painting shows the perfectly formed strokes of an accomplished decorator and is of a quality of excellence not always found on country painted tinware" according to Gina Martin and Lois Tucker who devote a rather large chapter discussing the work of Edward Francis in Volume Four of American Painted Tinware. Size is 13" x 18" and the condition is absolutely gorgeous with 99.9% of the decoration intact. He was truly a master of his craft.